This is a guest post by Jeff Siebach of Anchor Metrics. Follow them on Twitter at @AnchorMetrics. We all know the feeling. You log in to Google Analytics to see how your website has performed this week, and lo and behold, you’ve got more traffic than before. Much more! 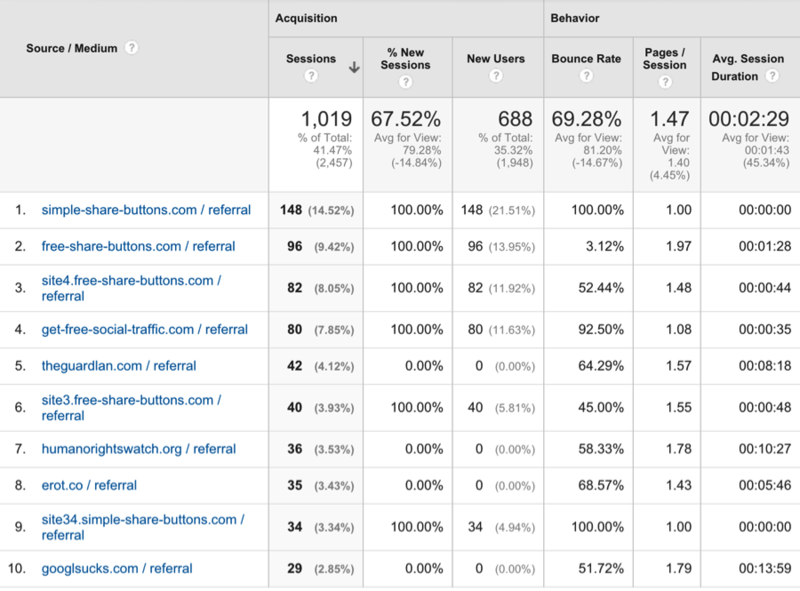 Then you get to the source/medium report and see that the increase came almost entirely from referral traffic. Did you get a new backlink? Did all those Twitter posts finally pay off? Then you start to browse the sources and the sparkle fades from your eye. You’re the latest victim in a new epidemic of “referral spam”. The kicker is that these bots don’t even need to visit your website to trigger these fake hits. Once they get a hold of your Google Analytics property ID number (Something like “UA-123456-1”) they are able to send URLs into your reports by executing the tracking code on their own servers. They can spam hundreds of hits from various websites into your account in mere hours. If you get a lot of traffic already, this may not skew your reports too greatly. For some smaller websites, however, this traffic can account for almost ALL of the sessions in your account. These hits often leave behind a trail of destruction, identified by 0% new sessions and a 100% bounce rate. 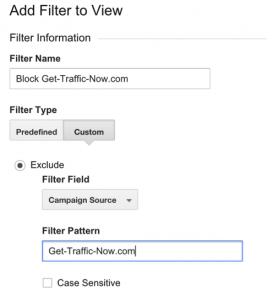 This filter will block all of the referral traffic from this domain moving forward – not retroactively. So next time you check your traffic, you wont see this domain. Unfortunately, you’ll probably see about 100 more domains that you didn’t filter. It’s a never ending game of whack-a-mole, and as soon as you stop playing, the spammers win. To combat the seemingly endless supply of spam websites that will continue to pop up, Anchor Metrics created a tool that adds filters to your Analytics account in bulk. With over 320 sites in our database at the time of this writing, we’ve compiled the most comprehensive list of spam domains that we’ve found. We’ve pulled in lists from blog posts, other similar tools, and our own experience to put together filters that eliminate all known spam domains from your sites. We also work with the folks at SpamScape.net, who devised a way to algorithmically detect this spam ongoing. To use the tool, head over to http://gaspamfighter.com and link up your Google Analytics profile. Select an account and the sites you want to filter (by default, we’ll filter all of the sites we know about). Click go, and the tool will create 20+ new filters that cover all of the sites in the database. You can use this on as many GA accounts as you need, although there is a daily limit imposed by the Google Analytics API. A week later, you’ll have some new spam sites appearing (they are vigilant, those spammers!). When that happens, head back to the GA Spam Fighter and run the tool on your account again. We’ll automatically detect the filters you already have applied, determine if there are any new sites to filter, and add a filter with any sites you haven’t blocked yet. It’s just like updating the firewall on your Google Analytics account. With any luck, Google will come out with a native feature that takes care of this for us (What does that “Exclude known bots and spiders” button do anyway?!). But for now, we hope the GA Spam Fighter can help you clean up your data and get back into the useful data we all rely on. Anchor Metrics makes tools for digital marketers. Their digital marketing dashboard offers rank tracking, review monitoring, and integrating reporting from AdWords, Analytics, Search Console, social channels, and more. You can schedule PDF reports, or create a white-labeled portal for your clients to access 24/7. If you’d like to learn more about Anchor Metrics, visit the site.